The goal in Spiderline 4 is the same as in Line 4: to place 4 pieces in a row vertically, horizontally or diagonally.. In the lair, the game is played on a 8x8 board. White place a pieces, then it's black's turn. And so on.. The rules to place a piece offer more possibilities than in Line 4. 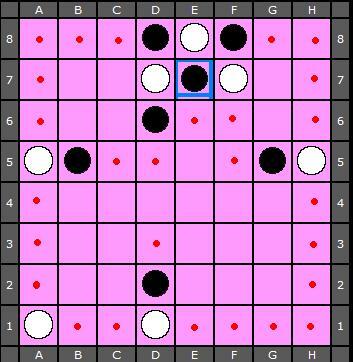 Indeed, not only the bottom line attract pieces (like in line 4) but all 3 edges of the board. that explains why it is called 'spider'line 4. Like a spide that can stand on the walls and on the ceiling.